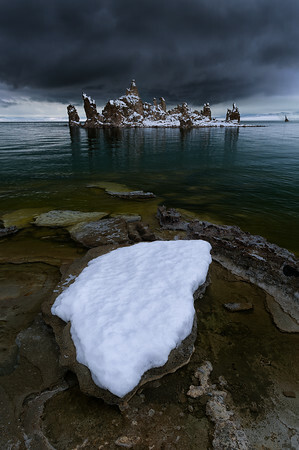 It's not every day you can get a shot of the tufa with snow at Mono Lake. We were so lucky to have this late Spring storm roll through in the month of May. My good buddy, Matt and I were the first people here at South Tufa hiking through about a foot of snow down the trail. We would have been here earlier, but the snow plows piled all the snow down the center of Hwy. 395, so we had to drive all the way to Mammoth Lakes before we could turn around. It ended up being OK because we spent some time shooting at Convict Lake, which was beautiful as well. The snow on the iconic Ship Rock and the low hanging storm cloud helped to make this one incredibly memorable morning.